Duplex is a term used for a household with different unit configurations. This term is used in different countries to convey different meanings. In densely populated areas such as Manhattan and Downtown Chicago, it refers to a single household unit spread over two floors. This is the category of Duplex design we will focus on in this article. We need to conduct case studies of individual duplexes or apartments that house duplexes. You might wonder, why is that required? Let me remind you that case studies are the backbone of our design. When we design, we begin with listing out requirements. For example, if we are designing a building and have no clue about its requirements, we might have difficulty getting the functional aspect of the design right. calculate the areas of individual spaces such as bedroom, bathroom, Hall, Dining, Kitchen, Utility etc. Studying the above mentioned aspects will help you with understand the requirements for Duplex design. Also, the study of connectivity of the spaces is very important and has to be done in order to get the functional aspect of the design right. “Efficient connectivity is the soul of any design”. Employ a professional surveyor and get the construction site surveyed. The site plan should be put into a CAD format. Make a list of requirements for the design of Duplex. 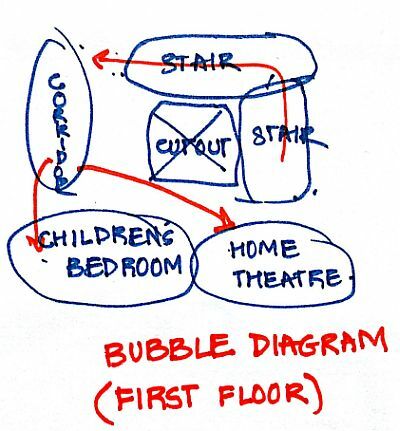 Assuming that you have conducted a casestudy and done enough online research for Duplex design and have the knowledge of the connectivity of the spaces; draw a bubble diagram connecting different spaces in the house. Bubble diagrams are often underestimated. They are efficient tools for coming up with connectivity patterns of different spaces. It works for all simple and complex designs. Draw a single line conceptual plan keeping the list of requirements in mind. 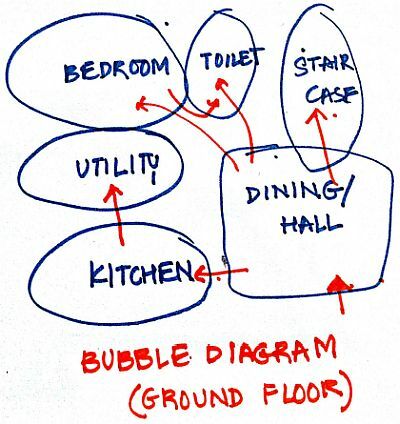 The bubble diagram will form the base for the single line conceptual plan of the Duplex. It has been practically demonstrated with the help of the video. I recommend that you watch the video alongside reading the article. Draw a double line plan for the Duplex after having discussed the conceptual plan with the client and make changes according to the feedback. The benefit of discussing the single plan with the client is that it would save you time and requires less effort. This was a basic guide for the design of a Duplex. Further detailing can be done by placing furniture using the CAD software. This would give you a complete idea of the circulation and connectivity of the spaces. Further, you could make adjustments in the plan depending on what kind of furniture you would like to have and ensure efficient circulation in the interiors. How to conduct a casestudy? In this article, eleven most important things to be analyzed during a casestudy have been discussed. Also, it gives a very clear distinction between literature casestudies and live casestudies. Their importance and purpose has been discussed. I recommend that you go through this article in order to get a clear direction towards conducting casestudies. This entry was posted by Benzu JK on March 29, 2013, 4:12 pm and is filed under Design Guide. You can follow any responses to this entry through RSS 2.0. Also important is making maintainability a key consideration from the first mental image to the completed building. Shape simplicity can vary depending on the competition and expectations of potential renters, but other things being equal, simple exterior shapes are often better. have gained a lot from this website but still need more casestudies which are missing from the list. tnx very much. I have a doubt….v r constructing a duplex house..and all d plan is ready…my doubt is dat …CAN THE BEDROOMBE ABOVE THE KITCHEN IN THE DUPLEX HOUSE…???? Of course it can be. There is no reason why it cannot be.